Are you eating a healthy diet, but still don’t feel well? Are you suffering from IBS, Gastroesophageal Reflux (GERD), or other digestive issues? Migraines/headaches, arthritis, fibromyalgia, eczema, sinus congestion or extreme fatigue? 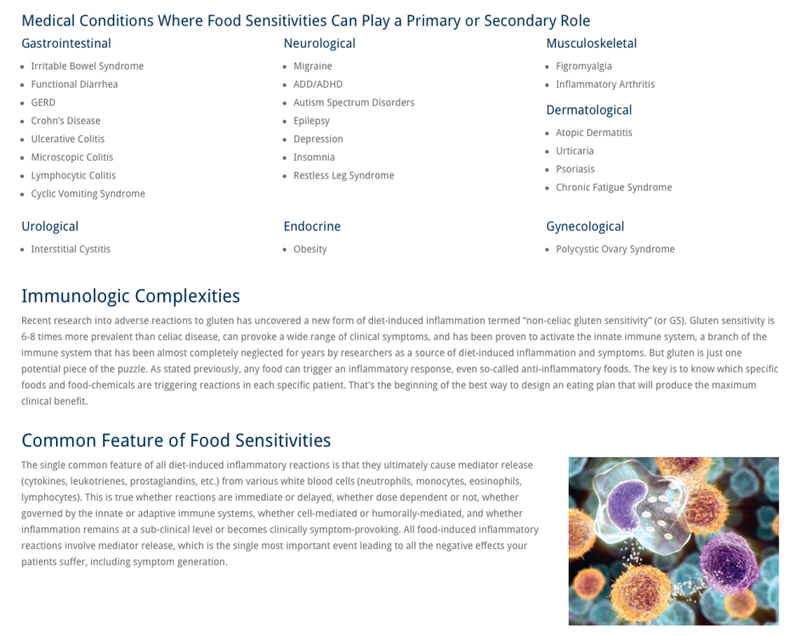 These are just some of the conditions that can be aggravated by inflammation caused by food sensitivities. They can wreak havoc on your daily activities, your concentration at work and even your athletic performance. There are 3 categories of diet-induced inflammatory reactions: Food allergies, food-Induced autoimmune disease, and food sensitivities. Of the 3, food sensitivities are the most prevalent. Food sensitivities are non-allergic (non-IgE), non-celiac inflammatory responses. When a reactive food is ingested, white blood cells release mediators such as cytokines, leukotrienes, and prostaglandins that cause inflammation and pain. Even if you are eating the healthiest foods that are typically known for being anti-inflammatory, those foods may be inflammatory for YOUR body. It can be difficult to figure out on your own which foods you are reactive to because the manifestation of a food sensitivity may not show up for hours or days and may be dose dependent. How does MRT testing work? The purpose of the patented Mediator Release Test (MRT) is to identify and quantify which foods and chemicals cause an inflammatory response in your body. It is an accurate test with 94.5% sensitivity and 91.7% specificity. 120 foods and 30 chemicals are tested. LEAP stands for Lifestyle Eating and Performance. After receiving your MRT results, a personalized diet therapy protocol will be designed for you. You will start with your least reactive foods and re-introduce other foods as you progress through the phases. The timeline is different for everyone, but many people start feeling improvement of symptoms within the first 10 days. Can MRT help sports performance? Many athletes who experience a myriad of symptoms such as chronic fatigue, Reducing inflammation in the body can improve recovery time and performance. What is included in the LEAP therapy package? This service is available in-person or online. Are you taking too many nutrients? Not enough? Nutritional status is a vital foundation of health and performance. SpectraCell’s micronutrient testing is an innovative assessment of nutrient status. Scientific evidence shows us that analyzing the white blood cells gives us the most accurate analysis of a body's deficiencies by evaluate how an individuals white blood cells respond to varied environments of over 35 vitamins, minerals, amino acids and antioxidants. As a result, individual differences in metabolism, age, genetics, health, prescription drug usage, absorption rate or other factors are shown in the results. 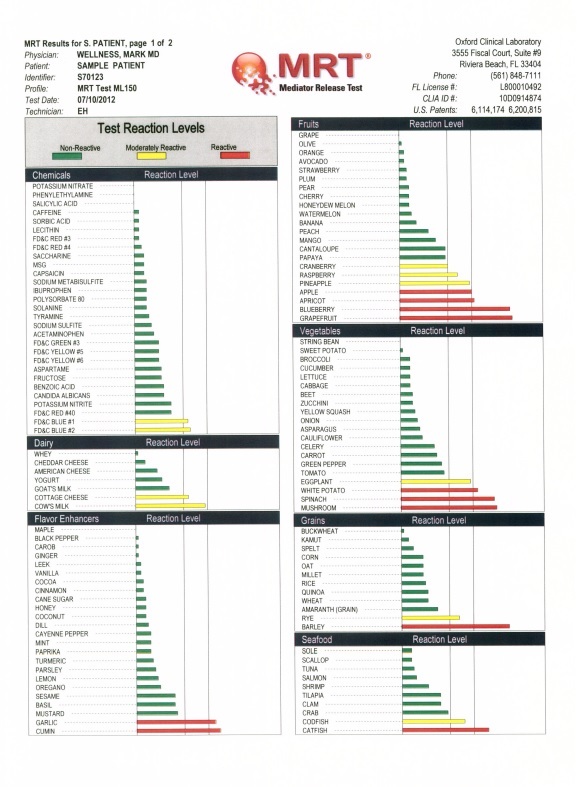 Patients get a complete professional graph of their nutrient status for all 35 tests along with a professional repletion program to correct deficiencies. Nutrigenomix Testing - Nutrigenomix is a University of Toronto spinoff biotechnology company using state-of-the-art testing procedures to analyze the DNA from a saliva sample. Nutrigenomix new 45 gene test can now determine how your genes can influence recommendations related to weight management, body composition, nutrient metabolism, cardio metabolic health, food intolerance, eating habits, fitness and performance and injury risk. Based on these tests, a series of nutrition and fitness recommendations are developed that are aligned with your genetic profile.